Before potatoes are processed, they should be pre washed and stones should be removed. Washing is important before peeling and for inspection purposes. Stones are removed because they will quickly damage your cutting equipment. The Rosenqvists Vertical Screw Destoner is a cost-efficient unit for ensuring clean potatoes, free of stones, for processing. Potatoes enter the water tank where stones with their higher density will sink to the bottom. The floating potatoes then enter the vertical screw and are elevated to the next step in the process (normally peeling). The stones are collected at the bottom of the tank and are easily removed through hinged doors. Before potatoes are processed, they should be pre washed and stones should be removed. Stones are removed because they can quickly damage your cutting equipment. Unwashed potatoes will admit sand into your machinery damaging bearings, gaskets and other components. Damage to these components can reduce machine life and performance. The potatoes enter the Rosenqvists Cyclone Destoner where water is circulating. Stones sink to the bottom and are collected. An optional Stone Elevator which automatically conveys removed stones to an external container can be included. The potatoes are then flumed into the washer drum where they are washed. Adjustable amounts of fresh water are added through a ramp of nozzles inside the drum. The water is continuously circulated from the drum to the cyclone. The water level in the drum is adjusted via an overflow valve. The pre washer does not have any bearings in contact with water. It is driven using specially designed belt arrangements. 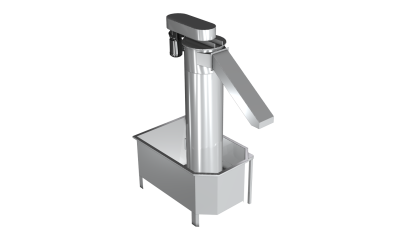 The Rosenqvists Continuous Abrasive Peeler is suitable for peeling potatoes, carrots and other root vegetables. Keeping water usage to a minimum and ensuring the lowest possible material losses during peeling are very important factors to consider when choosing a peeling system for your process. The result of peeling for each individual potato will affect the quality of your finished product. The Continuous Abrasive Peeler has eight high–speed rollers. The rollers can have different gauges of coated abrasive material depending on the desired peeling effect. Specially selected coating material and the coating process combine to make the rollers very durable and long lasting. 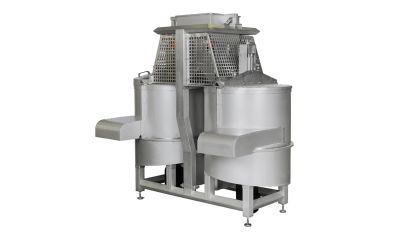 The abrasive rollers can be replaced by nylon brushes for optimum effect when preparing fresh potatoes or when the unit is used for deskinning. The rollers of the Continuous Abrasive Peeler rotate at a very high speed and the centrifugal force generated by it removes the peel waste. A minimum of fresh water is used for rinsing. All eight rollers can easily be exchanged if nylon brushes or a new roller set is required. A central auger conveys the potatoes through the length of the peeler. By adjusting the auger speed and the speed of the abrasive rollers, the desired degree of peeling is achieved. Speeds are adjusted via frequency converters placed in the control panel. Two covers at the top of the unit can be easily opened for cleaning. 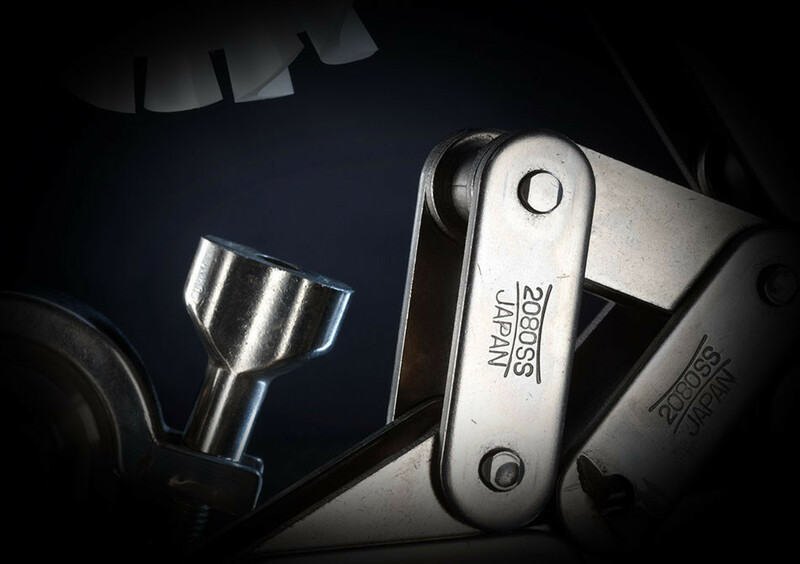 The peeler has central lubrication points for the infeed and discharge bearing components. The Continuous Abrasive Peeler can also be supplied with a peel waste pump system (optional). With such a system in place, the waste is pumped to an external container or waste area. 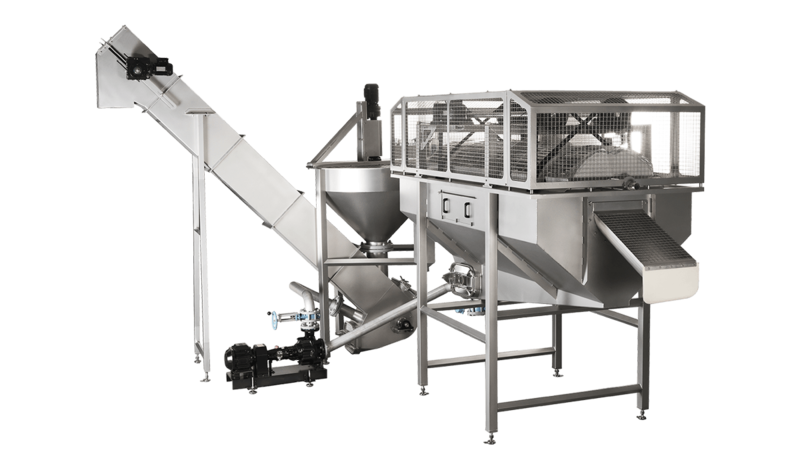 The Rosenqvists Vertical Elevator provides a very space-efficient solution for elevating potatoes. The potatoes are collected in a buffer hopper. Specially designed plastic belts with integrated lifters elevate the potatoes to the desired height. A chute arrangement designed for the next machine will ensure that potatoes are evenly fed forward. 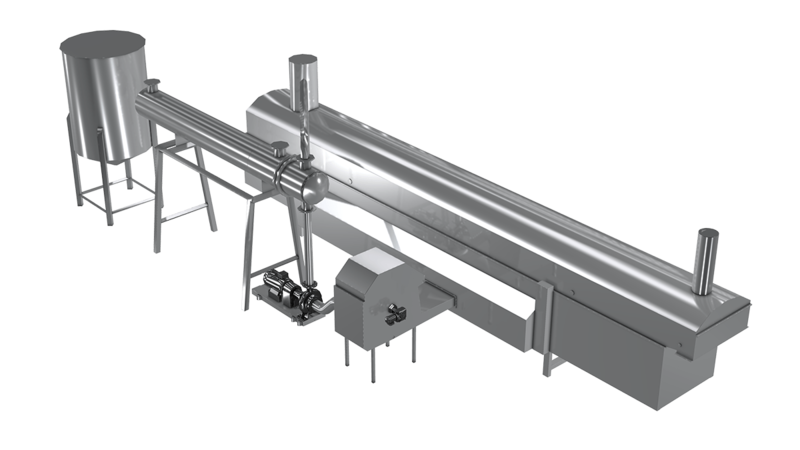 The Vertical Elevator belt speed can be adjusted to control the feeding rate to the next processing stage. 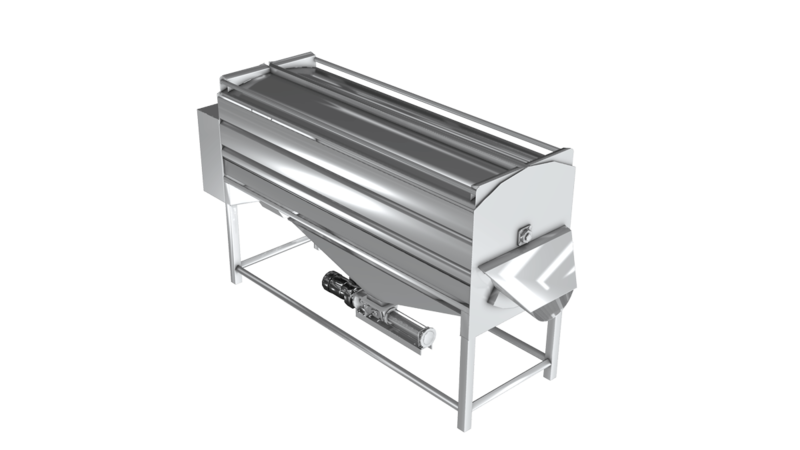 Larger buffer hoppers can be supplied (optional). The need for manual inspection of the peeled potatoes varies depending on the season and quality of the incoming potatoes. The Rosenqvists Roller Inspection Table has specially designed aluminum rollers. This ensures that the potatoes turn and expose the entire surface to the staff at the inspection table. The speed of the rollers can be easily adjusted. 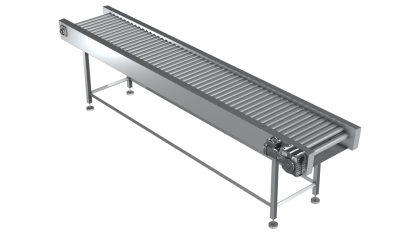 The inspection table can be fitted with separate waste/trimming belts on each side (optional). The cut trimmings are collected in a container. The roller inspection table can also be supplied with individual cutting plates for each inspector (optional). Please contact Rosenqvists for more information. Feeding of the cutting machines (slicers) is very important to ensure the even thickness of each individual potato slice. If the thickness of each slice is not even, the quality of each potato chip will not be consistent because the blanching and frying stages in the potato process are designed for evenly sliced potatoes. Best results are achieved by cutting one potato at the time. 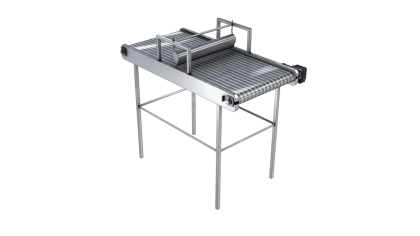 The Rosenqvists Singulator ensures that the potatoes are fed one-by-one into the slicer. 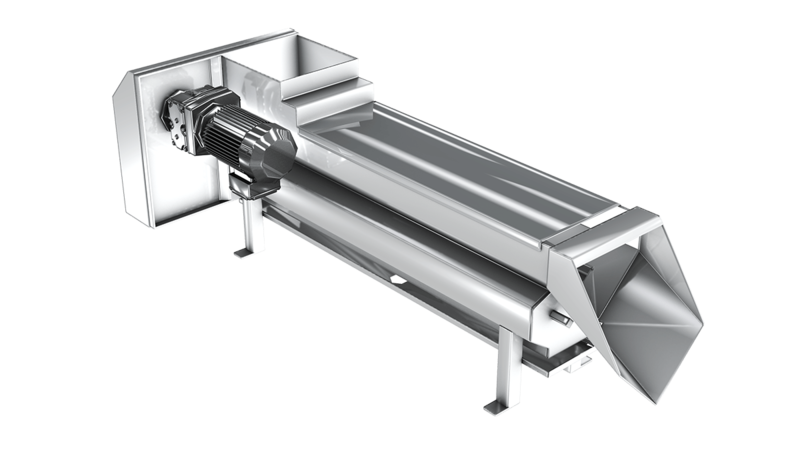 The singulator discharge chute can be adjusted to the optimum entering angle approaching the slicer. The singulator has two screw augers mounted in parallel. The potatoes are separated and fed forward individually. When the potatoes are sliced, the starch on the slices is washed away. If it is not removed from the slices, starch will be carried forward into the frying stage of the process. There, it can cause build-ups and could potentially block or damage oil outlets, piping or other components. The unique Rosenqvists Slice Washer washes every individual slice gently and controlled. The rotating tube is placed beneath the slicer discharge. The slices are gently washed twice inside the rotating tube. When they move forward into the vibratory shaker, the slices pass a sorting net. The gauge of the net can easily be changed to the size of the material to be removed. Fresh water enters the system via a discharge spray ramp. The water passes a bow sieve before it enters the second half of the tube. After this second washing step, the water passes a second bow sieve before being pumped to the slicer. The water then washes the slices a third time before passing a third bow sieve. A special cyclone system will further concentrate the amount of free starch in the waste water. The Rosenqvists 3-step Counter Flow Slice Washer uses a minimum amount of fresh water to effectively remove starch from each slice. We can claim that it is as good as, or better, than any other washing system. Our new design ensures a very high level of hygiene and it is very easy to clean. In the potato chip process, starch is converted to sugar. The frying process reveals the amount of sugar by darkening the colour. The darker the colour of the potato chips, the higher the sugar content. In order to reduce the sugar content of potato chips, the sugar has to be removed from the slice. This process is called blanching. 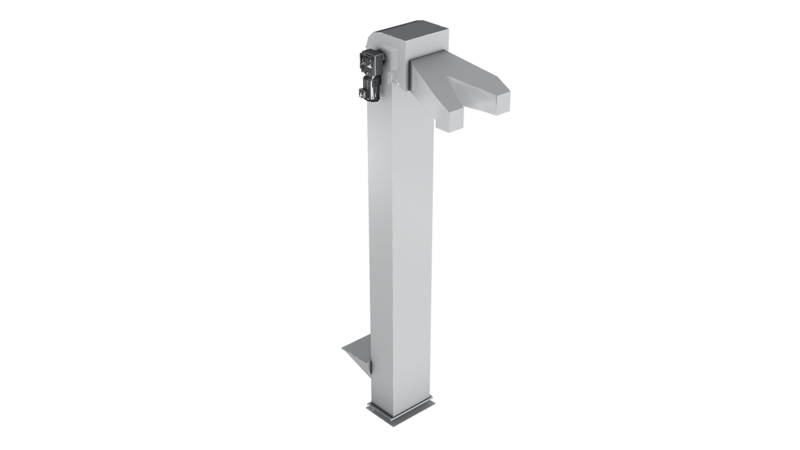 The Rosenqvists Counter Flow Zone Blancher uses hot water. Each slice is separated and treated individually. 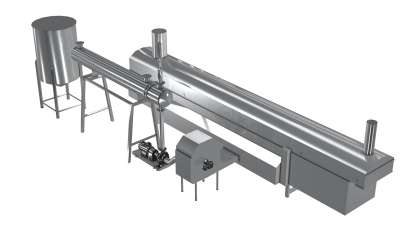 As the slices enter the first zone of the blancher, the paddle belt ensures that a constant amount of slices are conveyed through the machine. All slices are treated uniformly and for the same amount of time. The injectors create a turbulent water flow which separates the slices resulting in even heat treatment. The water in the different zones can be heated by either thermo oil or direct injected steam. Fresh water is added via a spray ramp above the discharge section. The water discharge is placed at the infeed. Due to the counter flow main water stream and the three temperature zones, the water in the process is used with optimal efficiency. 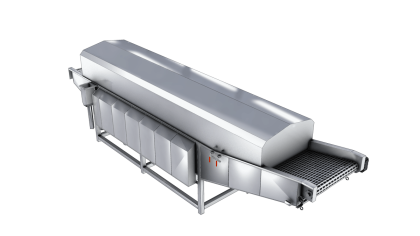 The Zone Blancher also saves energy as different temperatures can be set along the length of the unit. Before frying, the potato slices are dewatered and separated to give the best and most efficient frying result. 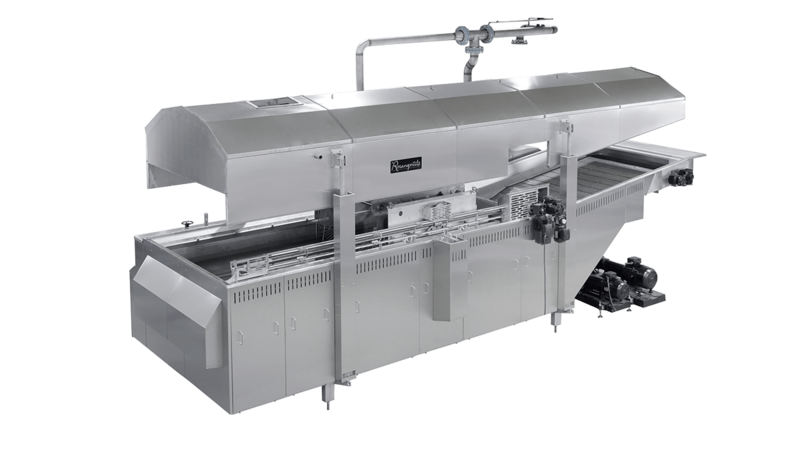 The fryer infeed belt is supplied with an air knife arrangement placed above the high-speed feeding belt. Passing the specially designed air knife, the slices are separated and surface water is removed. Beneath the feeding belt, suction boxes are placed to drain the water from the slices and the belt. The fryer infeed belt can be supplied with a special water cyclone arrangement for optimum water reduction (optional). The frying stage of the potato chips process is the part where texture, colour, bite, crispiness and overall quality are defined. The Rosenqvists Multi-Zone frying system uses the minimum of oil resulting in high quality potato chips with a longer shelf life. Low total oil volume results in low oil turnover per minute and lower FFA (Free Fatty Acids) values. Protecting the oil from light and oxygen is an essential criteria for the quality of your final product. The fryer pan has multiple oil in and outlets. The temperature profile along the pan is easily set and adjusted. In the fryer hood, a paddle belt and a submerger belt are mounted. The paddle belt maintains accurate frying time in the first section. The submerger belt conveys the product bed with accurately regulated speed. All the oil in the frying system is filtered every 30 – 45 seconds through the continuous drum filter. A perforated rotating steel drum filters the oil. Particles are scraped off and removed by a waste auger. 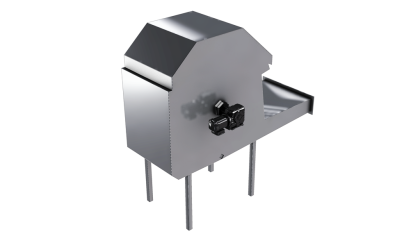 The heat exchanger, placed close to the fryer can be heated by thermo oil or high pressure steam. By adjusting the temperature profile and retention time in the different sections of the fryer pan, normal chips and batch-style chips can be produced. Filtering the vegetable oil is essential for good final product quality and good production economy. The continuous full flow oil filter filters every drop of oil every 30– 45 seconds. The continuous full flow oil filter filters the oil through a perforated stainless steel screen. The screen forms a drum; the particles are collected on the outside of the slowly rotating drum. 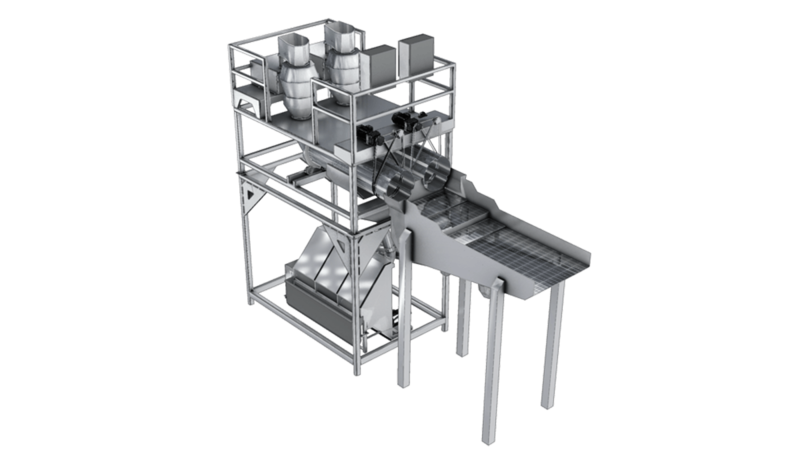 A set of specially designed stainless steel scrapers transfers the debris and particles to the waste auger.